In Design Management, Kathryn Best shows a timeline of design that put the Industrial Society (1830-1944) at the beginning of modern design. 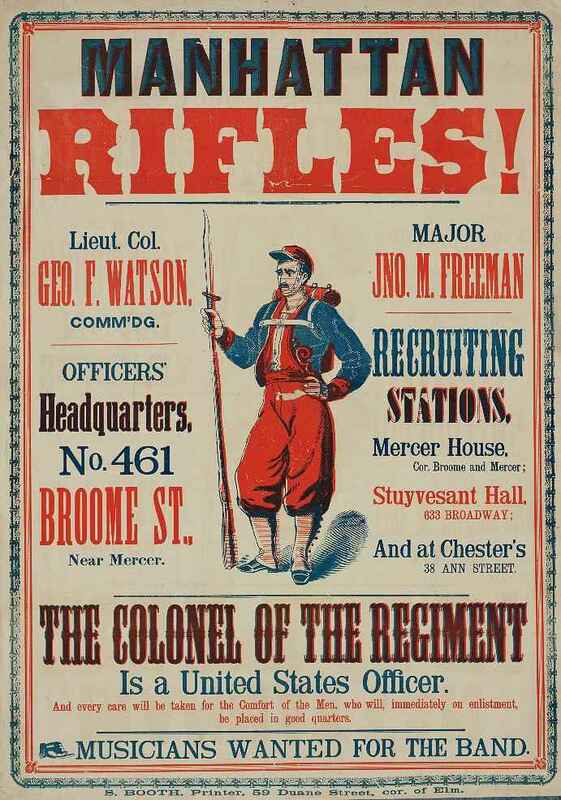 I chose to look closely at the Victorian Era of design (1840-1900), with Civil War posters (1861-1865) being my main focus for designing this poster. Although many of the “societal, cultural, or technological influences on design” (Best, 2006, p 20) shown on the timelines in Design Management are not directly print related, the fact is that much of that period’s industry played a huge part in shaping media design. Additionally, the steam-powered rotary press was invented in 1847 by Richard March Hoe and replaced the old hand-operated Gutenberg-style press. This allowed for “printing on an industrial scale, [and] Western-style printing was adopted all over the world, becoming practically the sole medium for modern bulk printing.” (Wikipedia, “Printing Press”). William Bullock then improved upon the rotary press significantly in 1863 with the invention of his web rotary press, which initially printed 12,000 sheets per hour, and was later improved to print 30,000 sheets per hour. (Wikipedia, “History of Printing”, “William Bullock (inventor)”). These improvements to the printing press would have allowed a large number of posters to be made in a short time – perfect for the recruitment of soldiers. Typographically, Wikipedia says that “the most notable invention [of the 19th century] was the rise of typefaces with strengthened serifs… In fact slab-serif fonts ([such as] Clarendon from 1845) were newspaper fonts, whose serifs were strengthened in order to prevent damage during the printing process.” (Wikipedia, “History of Western Typography”). 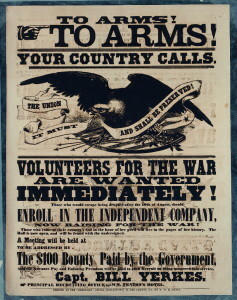 My own research confirmed this statement, as I found strengthened serif fonts, slab-serif fonts, and very bold, thick typography were present on nearly every old Civil War poster. Looking more closely at the Victorian Era, which encompassed the American Civil War, reveals additional characteristics as to the styles and ideals of the time. Parkland College’s website tells us (and demonstrates through multiple examples), “the Victorian Era was a time of strong moral and religious beliefs.” Additionally, the Victorian era brought a love for “ornate complexity and fussiness” in all areas of design, and was heavily influenced by nostalgia for objects of the past – earlier designs from England – like type in cloth banners, ornamental typography (often drawn on a curve), symmetrical layouts, and images framed within decorative borders – often architectural motifs. Although not all of these things made their way into Civil War poster design, their influence is apparent. Most notably are the ornamental Western fonts, and the fact that Victorian design and Civil War posters both try to “fill every corner of the entire page with type and pictures.” (Young, “The Victorian Era”). 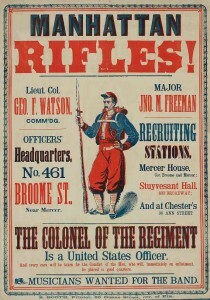 My own investigation into various Civil War posters revealed many similarities among them. Each line of text on a poster had a different font style and often used different font faces entirely. Sometimes very similar fonts were used that were either very stretched and tall, or very squashed, depending on the importance of the words their placement on the poster. Bold type at the top caught the eye, and was often followed by a more thorough description of details in smaller type toward the bottom of the poster. 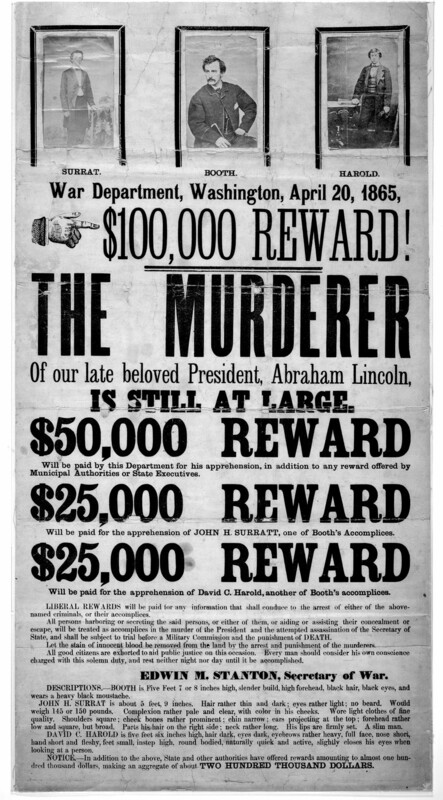 Nearly all the fonts were serif fonts, very bold and blocky, many with Western embellishments, although a few used some script fonts (particularly more modern recreations of Civil War posters5), and the text generally took up the full width of the poster. 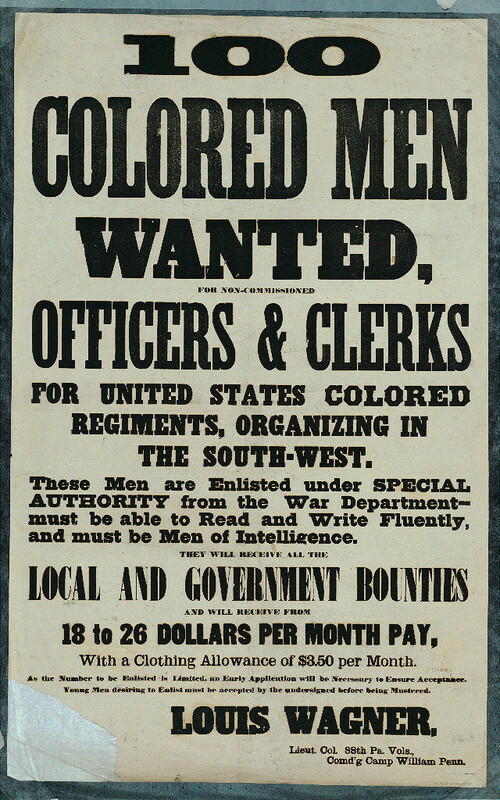 Writing on the posters was usually very formal, with full dates being written out in text, not numbers, and the posters were very informative. 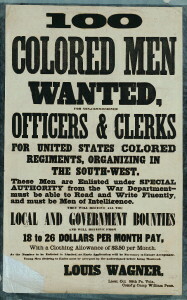 Additionally, the language used on posters was very strong – a language of urgency, immediacy, and strong moral principles. 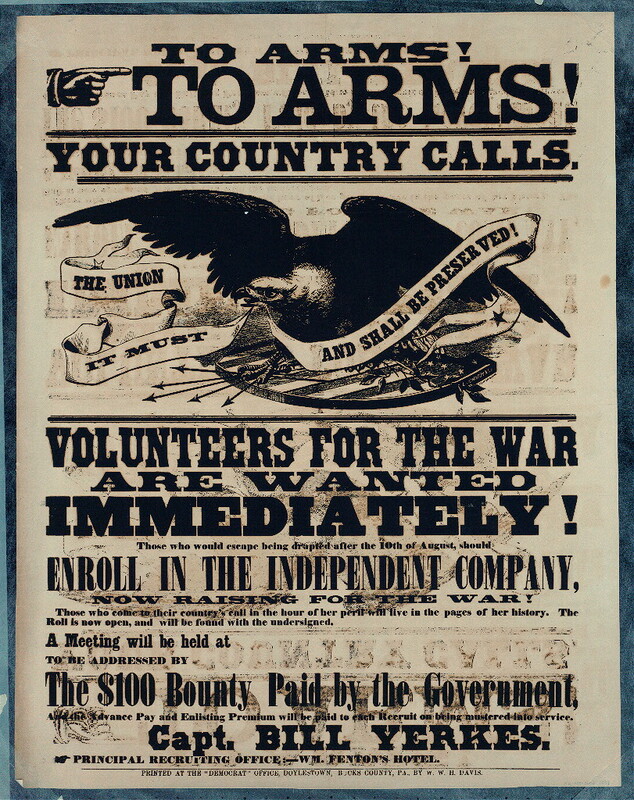 Images were minimal on the posters as text took up the majority of the space, but an eagle, American flag, and type in a cloth banner declaring the “unity of the Union!” were common elements. Additionally, nearly every poster contained at least one image of a finger pointing at the most important line of text. The images look hand-drawn, and probably were drawn onto a lithography stone for bulk printing. Everything was usually symmetrical, and every corner of the poster was filled with something. 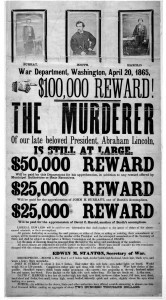 Some posters incorporated ornamental borders, but nearly every one used different weights of dividing lines to separate certain blocks of text from each other. The different weights of dividing lines – thin-thick, thick-thin, thin-think-thin, and so on – are as varied as the font faces used in design. I chose to design a poster for Korea, based on the recent sinking of their Cheonan warship, because I live here and hear many things about this story from various news sources. I think it is interesting that over fifty years after the Korean War, the two countries – North and South – are still technically at war with each other. Therefore, taking this recent event that pits North versus South, and basing my design on Civil War posters seemed like the perfect fit. 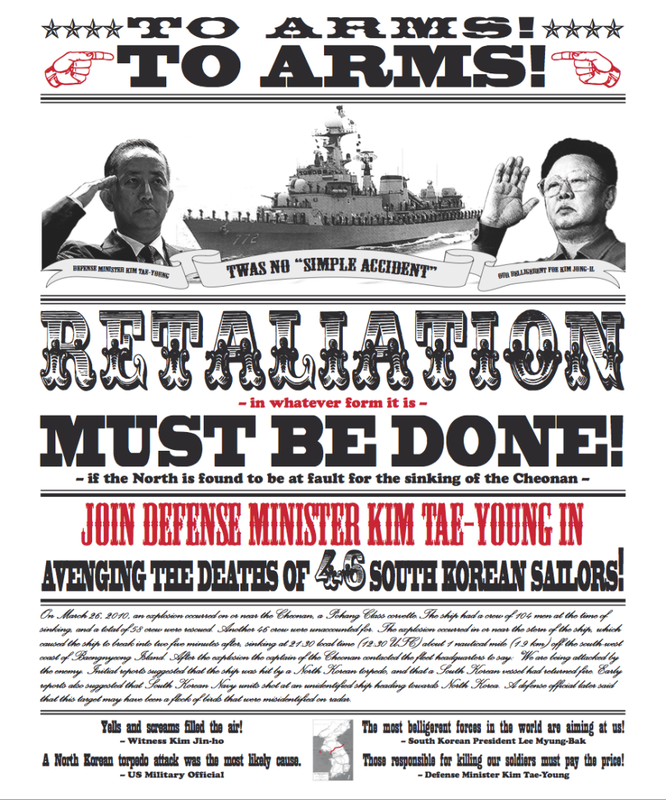 Finally, although I don’t condone retaliation against the North, I do feel that this poster does a good job of expressing the sentiment of many South Koreans, as well as reflecting the style and feeling of American Civil War posters. Additionally, given the escalation of news stories from both South Korea and the USA in recent weeks, I want this poster to express the seriousness of a call to arms against North Korea. As many have said – and it is true – something must be done. But military retaliation is not the right course of action, and I seriously hope that both Presidents in Korea and the US realize that before making any rash judgments that could seriously impact the entire Eastern part of the world. What do you think about the sinking of the Cheonan? What should be done about North Korea? 1. Basically, a design is drawn in oily ink on a limestone slab and affixed to the stone with an acid wash. Water is washed over the stone, being repelled from the design lines, and oily printers ink is then washed over that – being repelled from the water into the design. The whole thing (with paper) is then run through a press and an image is produced. (Masterworks Fine Art, “Lithograph”). 3. The majority of posters weren’t in color. Yes, please refrain from viewing in Internet Explorer. That browser uses old code to render web pages and is incompatible with most modern websites. In fact, developers often have to “hack” their website’s code to make it look OK in IE. It’s a huge pain, and quite time consuming. I’m looking forward to the day when IE is just a painful memory.